IMG_1382, originally uploaded by All Things Mimi. This recipe was absolutely outrageous! It cooked all day long- but boy was it ever worth it. Here is the recipe. At the end I will confess where I cheated! Salsa Verde Carnitas from "Simply Recipes"
1 Trim the excess fat from the roast. Put the meat in a large casserole or Dutch oven with salsa verde, onion, stock, cumin seeds, coriander seeds, and oregano. Bring to a boil over high heat; reduce heat, cover, and simmer until meat is very tender when pierced, about 3 hours. 2 Preheat oven to 400°F. Remove meat from liquid in pot and put the meat into a roasting pan. With 2 forks, tear meat into large shreds. Roast meat for 15 to 20 minutes until parts are brown and crispy. 3. While the meat is roasting, skim and discard fat from liquid in the casserole pan. Boil juices, stirring, until reduced to 2 1/2 cups, 8 to 10 minutes. 4 Return the meat to the Dutch oven. Stir in chopped cilantro. Season with salt. Serve with heated and softened corn tortillas (20 seconds each in the microwave spread out over a paper towel will heat and softened packaged tortillas sufficiently), diced avocado, crumbed Cotija or grated Monterey jack cheese, sour cream (or crema fresca), and seasoned cabbage slaw. Place thinly sliced cabbage in a medium sized bowl. Sprinkle on olive oil, seasoned rice vinegar, salt and pepper. You can substitute white vinegar or apple cider vinegar for the rice vinegar, if you do, sprinkle on some sugar to help balance the acidity of the vinegar. Toss. Adjust seasonings. Let sit for 10 minutes for the cabbage to absorb some of the dressing. I didn't make the slaw. I used flour tortillas because that's what I had. I didn't have coriander seeds so I used ground. 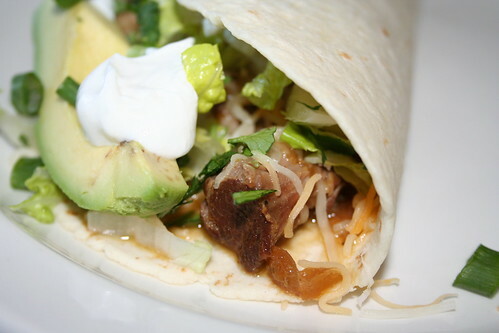 I served the meat with the tortillas, sliced avacado, chopped cilantro, chopped green onions, lettuce and sour cream. Next time I think I will use spicier salsa (or throw a chopped jalapeno in with the braising liquid) and I will use half broth and half beer to give the liquid more of a kick. great job! we just did a slow and low roasted italian-style pork shoulder and it's really the way to cook pork (low and slow). these looks fabulous. pork shoulder is so underrated! !